I’ve been spending a lot of time answering questions on Stack Overflow lately. From what I read, most of the questions come from unexperienced developers. It’s not easy to understand their questions because they often lack code examples, stack-traces or application logs. Because of that I keep repeating a lot of stuff in the comments or in my answers. I thought that it might be better to write everything down in a blogpost, so everyone has a chance to pick it up all at once. Because of this overwhelming complexity, it is very important to know the basic tools that come with Rails and that help me in my everyday computering. Rake was intended as a Make for Ruby. It’s basically a build-tool that handles tasks. It has become the swiss-army-knife of Ruby and Rails. So make sure you know when it can be useful for you! The basic commands are rake -T to get a list of public commands and rake -D to get the full description of the tasks. If one of the commands fail, you can pass the --trace option to see what rake is doing under the hood and find possible error causes. It is happening to me all the time. The application spits out an error and I have no clue what is going on. Providing meaningful error messages is one of most neglected parts in writing maintainable software. 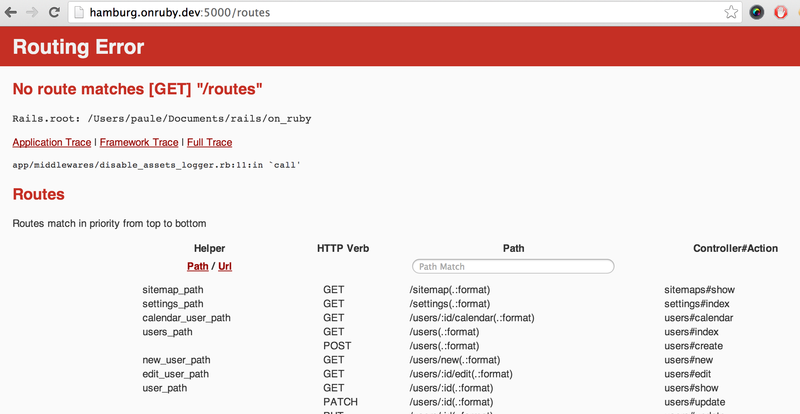 On average, Ruby is very helpful in that regard, Rails is not! Nevertheless, you should always read the errors and stack-traces because they contain helpful information like the source file and the line number where an error was caused. It even provides information about the context, like the calling object and the call-stack when the error happened. It is just an excerpt of the code, so it’s a good idea to add real line-numbers or an anchor so other people know where we are. In this example, this would not even be necessary, because role is only called once. Without knowing anything about the source, I can immediately see that the author wanted to use something that is not there. So possible solutions to this might be to use @role or maybe @visitor.role or to have a method called role or pass it in as a parameter to that method. If the test has run successfully before doing any changes, the error was probably introduced by some changes you did and should be easy to find. So always make sure your test suite passes before writing new code. Never throw away exception information unless there is a good reason! Swallowing exceptions causes a lot of pain for people that have to maintain the running application, so please at least log the error message when you rescue from something. I also often use dash to get method documentation. Rails coding is often CMD+R driven. I sit in front of the browser and reload the page to see if something happens… Unluckily it does not work the way I expected, so what to do next? It’s in the logs stupid! 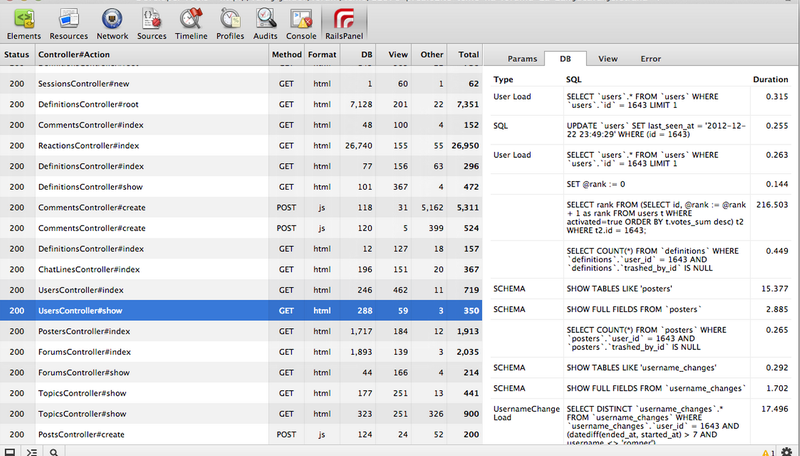 Since Rails introduced the asset pipeline, logs became pretty useless, because they were cluttered with asset calls. Disabling those logs does not need any ugly middleware monkey patches anymore because you can use the quiet_assets gem for this purpose! There are a couple of “workflows” which I tend to use in my everyday debugging, starting with simply adding p some_object, puts some_object.inspect or logger.debug some_object calls randomly to the code. For view templates i use = debug(some_object). This helps in about 50% of the error cases because it gives me enough context to find the problem quickly. Another thing is putting a raise some_object.to_s into the code. This is especially helpful if I want to find out when and how some part of the code is executed. Callbacks are a good example where this is a nice shorthand method for debugging. This functionality can be improved with a nice UI and a mini Rails console running in your browser if you add Better Errors and the Binding of Caller gem. These tools allow you to dive right into the error context and find out what might have went wrong. Combining this with raising my own errors gives me a lot of flexibility to quickly get to the point where I assume that something fishy is going on in the code. When you are doing a lot of ActionMailer related stuff, you probably want to install the Letter Opener gem to develop and inspect your E-Mails. Having tools like Better Errors is super nice, but they are only suited for usage in the Browser. This is not always possible and I fall back to real debuggers that allow for moving around in the call-stack and inspecting objects at runtime. The ruby-debug gem was the go-to-guy for a long time in Ruby land. It was a PITA to get this up and running in latest Ruby versions. That’s why I use the IRB replacement pry with a lot of extensions like pry-debugger or pry-nav. If you want to hook into a remote Rails process (ie. 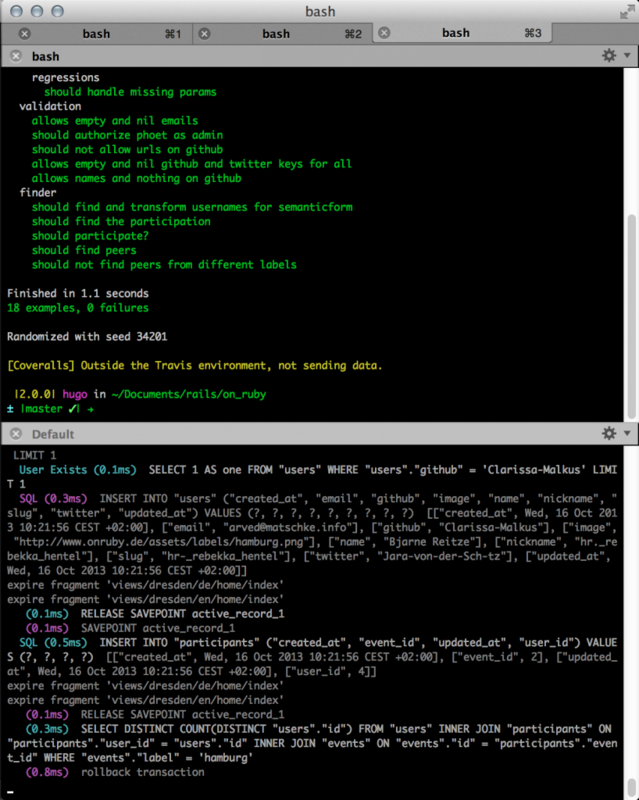 running rails via foreman) you can hook into it with pry-remote. 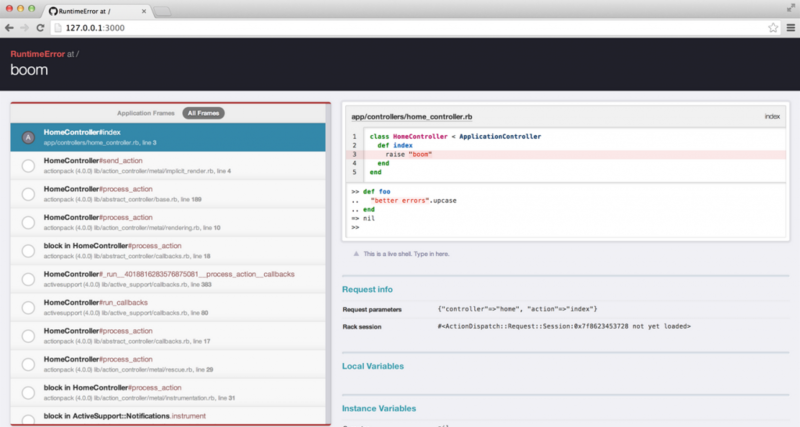 Have a look at the Pry Railscast for more information. I like to use pry-rails as my default Rails Console. It enables me to browse source code, inspect objects and do a lot of other crazy stuff. Just type help in a pry session to see what commands are available. My favorite command is wtf? which shows the last raised exception and stack-trace. I love test driven development! It is an everyday part of my programming routine. The only thing that I hate when doing TDD in Rails is the slow feedback loop. I don’t like using tools like spork or zeus as they introduce a lot of complexity and make debugging even harder. The last pattern is super useful when writing acceptance tests in capybara! I always forget how to use capybara expectations and matchers, because I write only a few of those tests. This is mainly due to the test pyramid and me being a backend developer. If there is some strange behavior during test execution, I just put a breakpoint somewhere in the test and call save_and_open_page or even better: print out current_url and open the running test instance directly in the browser! If you are using Google Chrome like me, you can use the Rails Panel plugin in combination with the Meta Request gem to get a Rails Developer Console in your browser. Super sweet! It is even possible to use the “Copy as cURL” option in the Chrome Developer Tools to get all the parameters necessary to redo some request! I use Navicat as a multi db frontend. It allows me to inspect what is going on in the database, check query results, indices and create data on the fly. Always have a good client for your data stores available! I love git! It’s not the most self explanatory tool on the planet but it helps me so much when debugging applications. Just one example here is using git bisect. It executes a command for a range of commits, so that it is possible to find out which commit introduced a problem I am trying to debug. Here are some websites that I keep referring to in a lot of my answers on stackoverflow. Go ahead and check all of them, really, I mean it!